There are neighborhood gardens, collector's gardens, public gardens, and designed gardens. I have visited all of these kinds of gardens and more, but never before have I visited a botanist's personal garden. Peter Goldblatt, professional botanist, has cultivated magnificence here in Portland for the last 10 years. I was lucky enough to meet him and his partner Lendon and visit their private paradise. A mutual friend Sharon Bronzan (with whom I visited Sheila Ford Richmond's garden) suggested I see this special place before Peter and Lendon left for a long botanic vacation in the Himalayas. She and I visited at the end of a long, hot summer day recently. I was honored to be able to visit and photograph this amazing collection. When we pulled up I knew this was going to be an experience unlike any other I'd known as a garden blogger. It was immediately apparent that a whole host of unusual perennials, trees, shrubs and grasses take center stage here. Peter Goldblatt is a leading expert on the iris family, having spent his life studying its taxonomy, evolution, and biology. He is currently Senior Curator at the Missouri Botanical Garden in St. Louis. A native of South Africa, Peter was educated at the University of the Witwatersrand and earned his Ph.D. from the University of Cape Town in 1970. He spent forty years studying irises in South Africa, Kenya, Malawi, Zambia, Tanzania, Namibia, and Madagascar. In 1999 he was awarded the International Bulb Society's Herbert Medal. Author of many papers, Peter has written several books, including The Moraeas of Southern Africa (1996), The Genus Watsonia (1989), The Woody Iridaceae (1993), Gladiolus in Tropical Africa (1996), and Gladiolus in Southern Africa (1998). Goldblatt and John C. Manning are coauthors of The Color Encyclopedia of Cape Bulbs ( 2002) and Crocosmia and Chasmanthe (2004). In his spare time, Peter enjoys reading and traveling. This man is a rock star in my world. Oh, my gosh. I had no idea. I felt rather small and silly but Peter and Lendon were so gracious and answered all of my questions. Truth be told, I was so overwhelmed I forgot to ask a lot of questions that, in hindsight, I should have asked. Let us take a tour around the incredible botanic paradise. Fair warning: there are a lot of photos here as I took a few hundred in all. Actually, this post is rather abbreviated by comparison. Here is a link to his most impressive C.V. He claims to not like asters, but they liked his garden. The pop of color made them photo-worthy. This living arch serves as a gateway to the back-garden by way of the western side-garden. Ariasaema fargesii, I believe. Common name is Asian Jack-in-the-pulpit. Immature fruit from a quince bush. Agapanthus, sword ferns, maidenhair ferns and deer ferns in the background. A lovely, shady woodland nook in the front garden on the way around to the back. Climbing Corydalis claviculata. I saw this plant at Portland Nursery last summer and now I regret not buying it. Path leading us to the back garden, the corydalis is visible on the right climbing up what I believe is a physocarpus or ninebark. I count what...maybe eight different species in a two-by-two square foot area? If I knew the square footage of the garden I could estimate how many plants are here. Thousands, easily. A beautiful rhododendron, possibly Rhododendron pachysanthum. Path in the back garden. Crocosmia 'Solfatarre', a plant we both agree is a winner. It's my favorite crocosmia species and a new addition to my own garden. The silver plant could be Artemisia absinthium. An old familiar friend, Mimulus auruntiacus or sticky monkey flower. View of the back garden from a path on the west side. What a lovely place to enjoy the garden. Pittosporum upper left, rodgersia and thalictrum. Could not remember this plant. Anyone? - Denise from A Growing Obsession I.D. 'd it as Galtonia, which seems spot-on. Thank you, Denise! Shade garden, the lawn is just visible on the left. It should be noted that Lendon is the mastermind behind the landscaping aspect of this incredible garden. Shade garden with a wonderful water feature. Achillea, a rare one - I believe Peter said Achillea sibirica. Here is the path leading from the lawn to the shade garden and then the wonderful waterfall feature just visible at the top of the photo center. Royal fern or Osmunda regalis. Having seen this beauty in Peter's garden, I bought one from the nursery where I work. Thalictrum species. Such fairy-like flowers in the shade garden. Evan Bean of the Practical Plant Geek properly I.D. 'd it as Anemonopsis macrophylla. Thank you, Evan! What color and texture combinations. They were everywhere, and every photo is different. There is something to keep a plant-lover busy for many years. Part of the path on the eastern side of the garden leading down towards the shade garden which opens up to the lawn and sunny borders. I believe this is Epimedium wushanense. Wow, what leaves! Asiatic lily with astilbe in the background. Hakonechloa macra on the left and a Nandina domestica 'Filamentosa' on the right. Mahonia 'Soft Caress' on the left. Japanese painted fern on the right. Potentilla gelida in the foreground. This path is in the sunny garden. They lit the fire for us. What a treat. While Sharon, Peter and Len were relaxing, I was madly taking photos before the sun set. The house is a 1900 mill-worker's home that Lendon added onto over the past couple of decades. It's in a wonderful neighborhood of Portland, too - John's Landing near the Willamette River. Toad lily or tricyrtis species. Artemisia (I think) and Potentilla gelida and maybe three other plants in there. Hydrangea quercifolia or oakleaf hydrangea with the greenhouse in the background. One of my top 10 favorite plants. Fantastic urn, a focal point like this gives gardens a sense of place. Hakonechloa macra, hydrangea, coleus, and what looks to be Impatiens balfourii on the left. A kind of senecio--Peter could not remember the species and I have never seen it myself. It could be Senecio cephalophorus. Sedum laxum on the left, heuchera on the right. Lovely sculptural focal points in the garden surrounded by hostas, a maple tree and more. Len is a smart man. Around the garden perimeter he has left this space to be able to access the garden from the back side so as not to disturb the garden. What a genius. This should be built into every garden if space allows. Rhododendron species, maybe a Rhododendron yakushimanum hybrid. A final look back at the home and the front garden. I asked Peter to describe his garden. He put the question back on me asking how I would describe it. Foolishly, I answered "Tropical" then realized my mistake. I just meant tropical in the sense that it has a va-va voom lusciousness about it. He never did answer my question, I think because it's a really difficult one to answer. It's his garden, unlike any other. Obviously, there are a plethora of hardy plants which I recognize but also many other treasures that you just have to discover on your own. It's a garden for a man who has been involved with plants on a very elite level for decades. It's a garden of a collection of plants cultivated with an incredible partner who built the foundations for such a place. Peter, I cannot thank you enough for your's and Lendon's time and for opening your garden to a humble garden blogger. I want the rest of Portland and beyond to know such a treasure exists here and if we're all lucky, perhaps you'll open it again for future Hardy Plant Society of Oregon open garden dates. That's it for this week at Chickadee Gardens. Until next time thank you for reading and happy gardening!! Not all botanists have an eye for planting combinations but he certainly has it :) lovely garden! He sure does. The way the paths meander through the garden and the choices are just so inviting. I think I would have tried their patience, making sure I saw every plant in every nook! Just amazing. Aaw, well Alan I could have too but I did not want to tie them up any longer as it was dinner time. I am hoping for an open garden someday! What an incredible garden, and what luck to be able to visit it. I hope they listen to your encouraging advice to open it for the HPSO. I was recently asked "What is your garden like?" and had a hard time answering. "It's got lots of plants, and um, different areas..." It's a difficult question. I will be at a total loss if I ever have to describe it for a tour. BTW, is the white flower Leucojum? Maybe not, as it doesn't have the green spots on the petals. It IS so difficult to answer the "what is my garden like" question. Yes, the white flower is really tall and no green spots but good idea. When asked about my own garden I jokingly describe it as Northwest Mexican. Holy crap, that's amazing. Thanks for sharing it with us! You are welcome, Amy! Glad you enjoyed it. Wow Tamara! You must have been in heaven, what a densely planted masterpiece. I stared at that first photo for a long time, feeling like I'd seen that much of the garden before. I must have walked, or driven, past it when I worked in the John's Landing area. Little did I know what else was back there. Thanks for sharing! Yes, pretty much in heaven. I bet you must have seen this garden/home from your John's Landing days...you have such a talent for spotting the amazing gardens. Glad you enjoyed it and got to peek around back! I was pretty lucky to do so in person. 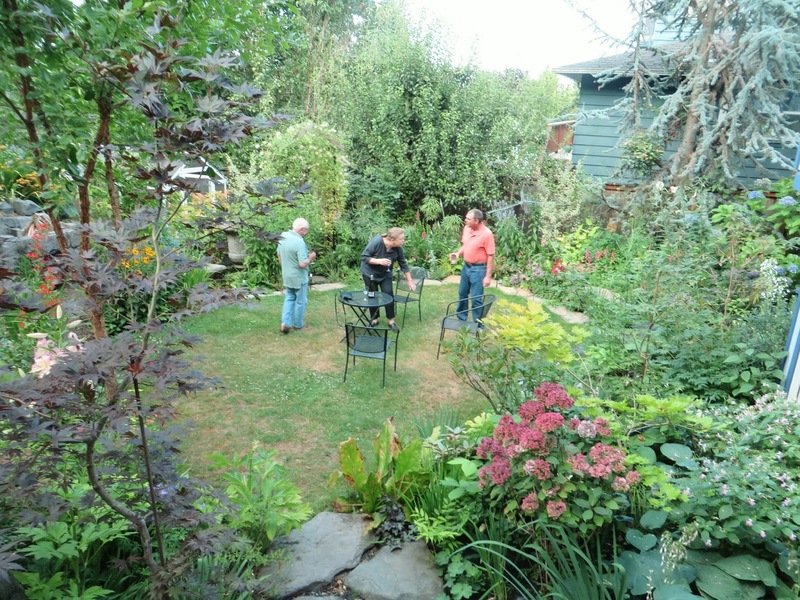 Watch for this garden in HPSO open gardens...I think they have opened their garden before so it's possible again. I have that same unknown senecio! Unknown to me too. I'm so glad you visited and blogged on this plant-rich garden. That Potentilla gelida is really making the rounds in Portland gardens! I'm tempted to try it in SoCal but it just looks made for more northern latitudes. Could that white flower be a galtonia? And YES, I think your ID of Galtonia is correct, thank you!! Ye gods, what a fantastic garden. I'd have stumbled around in a daze, a la Mr. Toad. Great photos -- that last one is like a dream. Thanks for this! Isn't it fantastic? Well said, Luisa. Ha ha...I kind of felt like a Mr. Toad while fumbling around taking pictures like mad before the sun went down. Glad you enjoyed it! I love it. Thank you so much for discovering this places for us. I´m always thrilled to see a botanists or plantsman/women garden! Glad you enjoyed it, Lisa! His is a garden that just has to be seen rather than described. A special garden to be sure! So many great plants and combinations along with great hardscape. A garden as impressive as the gardener! Indeed, well said, Peter. The hardscaping is amazing, Lendon is fantastic. wow! What a magical place! Thank you! It is magical, thanks, Fifi! What an amazing opportunity! Thanks for sharing. The shade garden is my favorite part. The rock work is beautiful and the plants are incredible. That Thalictrum species is actually Anemonopsis macrophylla, uncommonly beautiful. It was an incredible opportunity and I feel quite humble about being able to visit. The shady area was my favorite, too. Thanks for the Thalictrum I.D.! What an amazing garden! I loved the idea of the little walkway around the perimeter for easy access to the back. You must've felt very honoured to be able to visit, and you practised much more restraint than I'd have been able to wih your amount of photos! (I would've gotten a bit too carried away) Thank you! Isn't that perimeter area wonderful! I love it and it makes so much sense. I could have done a post with easily 100 photos but who would read such a long post? Ha ha...well, maybe a few of us nutty plant people! Thanks for reading and commenting, Amy! I'm glad you took lots of pictures! It looks like one of those gardens that you could explore carefully for weeks and still see something new the next day. Not only are there lots of intriguing plants but they've been put together in wonderful combinations as well. The rock creations are also well done. Thank you for sharing your visit. Oh, yes indeed one could spend weeks and weeks here. The rock work is wonderful, the whole garden has a sense of flow to it that makes it not only very accessible but comfortable, too. Every plant collector should have a Landon to pull it all together. Fabulous plants, fabulously placed for maximum impact. I KNOW! Lendon? Are you listening? We all love and admire your work! I bit slow, thanks Tamara, your blog on our garden is fab. A wonderful compliment. Please come again. What a fun tour of a special garden. Thanks for sharing! Paradise unearthed - and right here in PDX! Finally had a chance to read this post - what an fabulous adventure! Thanks for letting us experience it through your eyes. So much to take in and absorb - I have to say I also really loved the poetic touches of Dichondra spilling over the rocks, just like the "real" water feature in the background. Lovely indeed. I'm now hunting for that Anemonopsis - it is gorgeous!